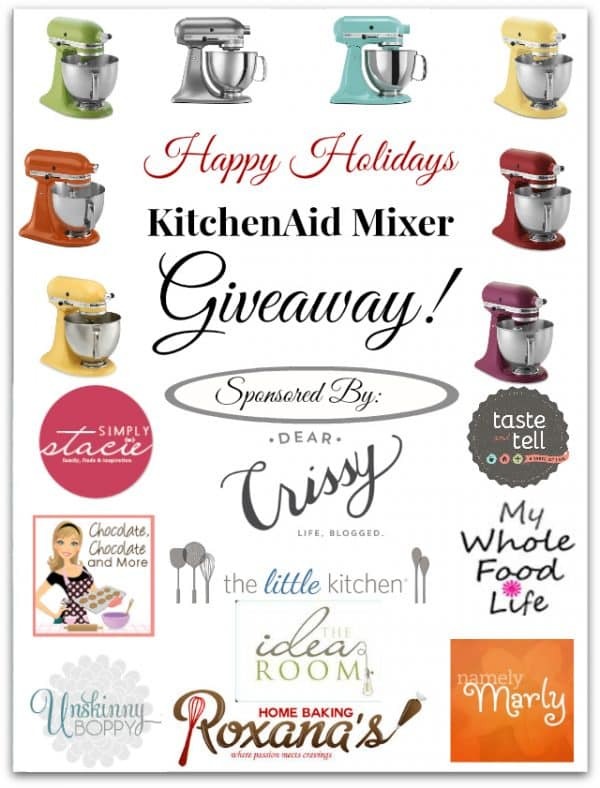 Happy Holidays Kitchenaid Mixer #Giveaway - Chocolate Chocolate and More! When I first got my KitchenAid Stand Mixer, I had to settle for plain White (colors cost more.) But you won’t have to settle if you win! Yes, I’m excited to tell you, you’ve got another chance to win a Kitchenaid Stand Mixer! Thanks to a fabulous group of bloggers, we’re offering a chance to win a mixer in one of several color options! Just follower the rafflecopter below to enter and good luck! Open to US and Canada residents! Oooo… I’ve been begging Santa for one of these for years. He never comes through for me – but maybe you will! Thanks for the chance to win a new kitchenaid Mixer!! Thank you for another chance at a great giveaway! 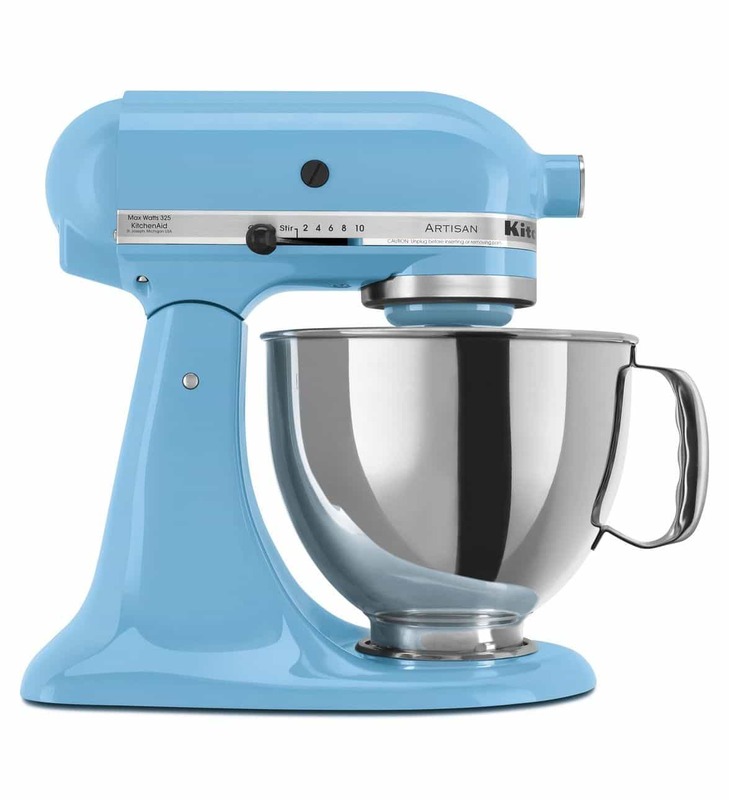 Thank you for the chance to win… I would soooo love a KitchenAid mixer…. I’m so happy that I found this website !!! can’t wait to start baking these coming holidays !! every thing looks so good and so easy to make it …thank you !!!!!! thanks for the chance to win one of these mixers. I loveeee thats kitche aid thanks for that fabuolous prize!! im in love!!! I look forward to seeing your recipes when they pop up my Facebook page! Thanks for sharing!! I have been wanting a Kitchenaid mixer for so long. I hope I win. Hii, I’m so excited about the giveaway! I love to bake and make breads and I know the kitchenaid mixer will be used a lot! Yes, thank you for another chance to win. My mixer is old and needs to be replaced. I do a lot of cookie over the holidays. This is a great gi eaway I hoping to win. I need a mixer so bad 🙂 Happy Holidays to everyone! Thank you for the giveaway I’ve always wanted a Kitchenaide mixer and never could afford one. So here’s to good luck. Thanks for the giveaway. I have been wanting one of these as I keep burning up my handheld mixers. We call them disposable mixers at my house. I would love thiw for my daughter. She’s worn out mine! Thank you for a chance to win this great mixer. I have always wanted one !!! Dear Santa, I want a Kitchen Aid mixer for Christmas! Thank you! I never had one….I would love to win one…..maybe Santa would like to bring me one…. I am using my Mom’s Kitchen Aid mixer which is now considered an antique! It would be great to get a new one!! Really great! I’m hoping Santa will give me a new Kitchen Aid this year, so I can make yummy Christmas cookies for the family. I used a kitchen Aid Mixer for years…i did wedding cakes and other special occasion cakes, breads, etc. My 3rd mixer is now on it’s last leg…not all speeds working. I even have the oil dripper for making icings. mayonnaise specialties, etc. I would LOVE to have a new one. I have enjoyed using my Kitchen Aid Mixers greatly. Those mixer have caused me to go on to using all Kitchen Aid products…My dishwasher, etc. and to pass the word on to my friends and customers. Thanks for the chance to win! I could use one! You ladies are so wonderful! I am so excited for this chance to win a KitchenAid. Yippee! Thanks for another chance to win! These colors are so beautiful! Would love to win! I’ve always wanted a kitchen aid mixer and told my husband but I never got one. I hope I have the opportunity to win a green one! Ahhh, I’d love to win. I’ve been wanting one for years but they’re just out of my price range. Would love to win !! Absolutely gorgeous ! I’ve always wanted one, hopefully I win this awesome giveaway. I would love to have this mixer, then I could bake more. Merry Christmas and good luck to all. Thank you for the giveagey!!! Thanks for making this dream of mine a possibility–I could never afford one of these great Kitchenaid mixers! Dear Santa, I’d love to have one of these for Christmas! Nattalia, are you logged into FB when you are trying to enter? I have one but I need to win this for my sister whose family is struggling financially right now. She doesn’t have a very good mixer. She does a lot of cooking for 5 people plus my invalid mother who my sister is taking care of 24/7. I´d love to win it, I love baking, so I would use it a LOT!!! I would love to have the light blue mixer pictured here!! I have almost worn mine out that I bought several years ago! I bake and make several gift boxes at Christmas and also for birthdays during the year for friends and family! I would LOVE to win one in a color!! Green is my FAVORITE COLOR!!! Nooooooo. Its 1:01. and I need that mixer so bad. 12 grandkids. I have an old Kitchen Aid mixer, it still chugs along, but will definitely have to be replaced soon. Would be nice to win a new one so I can do other fix ups in my kitchen, that will have to wait if I have to buy a new one. Love your recipes and all the posts you have. Thank you. Thanks for the chance to win such a great prize! Love your recipes. I have been wanting one of these for SO long, also I LOVE your blog!!! What an AWESOME mixer!! I’m looking forward to using it!!! How incredibly fantastic! The KitchenAid is a wonderful wonderful thing! Santa knows I need one of these! So happy to have this chance to win this mixer!! I have been wanting one for so long!!!!! I’m not sure which one to select for the contest entry. I was looking for your tab on pinterest? Which one should I select?? Just to show you how much I wish I could have one of these. Before I found your e-mail, this morning-early morning- Instead of getting up early to leave, felt I just had to watch the new KitchenAid infomercial first. I enjoyed it! It just made me want one even more. I would want the pasta attachment first. I so wish I could have one….. Is it OK to enter more than once???….. The baker inside of me would love to have one of these! A huge step up from a hand mixer! Dear chocolate and chocolate and more I hope I will win tis mixer I have been wonting one for a long time but I have three children I just cant afford it right know. but I understand if you don’t pick me i’m use to not getting much any ways but it will sure be nice if I did win because I love to bake I bake when I have the stuff wasn’t for being on food stamps I would not be able to bake but thank god for that right. but I hope I do win. it will sure be a lot easier for me to bake since I have bad health anyways. How sweet would it be to win one of these?! But honestly, I want a dishwasher too! My hands aren’t what they use to be but I will not stop. The mixer would just mean I could bake more. Any color will do just need a little hand. Thank You ahead of time. One grandson just told me today that I better bring more of my rolls to the Thanksgiving Dinner. Yes I will fix him his own !!!! I need this for my sister so badly. She created a whole Thanksgiving meal with just a dinky little hand mixer. She is disabled and hard for her to hold anything but she did. She also takes care of Mom 24/7 and cooks for 5 people: Mom, husband, 2 adopted grandchildren, and herself. her husband is out of work right now. This would make her so happy. I have one and love it. Thank you for the chance to win a Kitchenaid Mixer….would really love to own one. So fun! Thank you for a chance to win this lovely prize! !